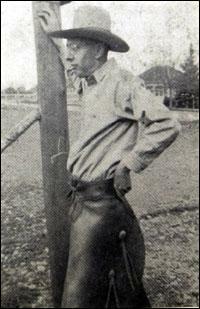 Photo provided - Archie Joscelyn was dressed in a cowboy hat and chaps for the self-portrait that appeared on the back of many of his western novels. By all accounts grandson Alan does not remember ever seeing his grandfather in such attire. The mortgage is due on the family farm, the creek is going dry and there are sheep running loose in cattle country. Toss in a murder, a crooked judge and an old-fashioned fistfight, and you've got the trappings of a rough-and-tumble Western -- Archie Joscelyn style. Archie who? you might ask. Joscelyn, gone now for 19 years, could be considered one of Montana's most prolific writers, publishing more than 200 novels under 12 pen names, including Al Cody, Jacqueline Kidd and Lynn Westland. Yet the genre of Joscelyn's work has excluded him from the literary canon. Although they wrote much less, writers like Norman Maclean and James Welch are better remembered. "My father wrote and produced an awful lot of material, but Westerns are held in low repute," said Alden Joscelyn. "For most of his life, his writing wasn't a big deal. It's just what he did." Joscelyn was born in Great Falls in 1899. He graduated from Belt High School in 1921 before enrolling at Montana Wesleyan University in Helena to study journalism and history. Not until Joscelyn's death in 1986 did Alden realize what his father had accomplished. By then, Alden admits, it was too late to ask the questions that troubled him. He was left instead with memories of his father's early mornings at the typewriter and his late nights in the rocking chair. "He certainly talked about his stories with my mother -- asking her opinion and what she thought of them," Alden said. "I suspect that had I been more interested, he would have shared them with me." Alden wasn't the only one surprised by Joscelyn's prolific nature. Working from his downtown law office, Alan Joscelyn keeps several copies of his grandfather's books on his shelf. He talks of the man with pride and respect and has even taken to writing himself. "Growing up, I never realized the significance of my grandfather's work," Alan said. "He was a writer his entire adult life. He sold his first story to a magazine when he was about 16. After that, writing was what he did." Stories like "Saddle River Spread" sing of new hope and frontier spats while "Yates of Red Dog" recalls the battle between Anaconda and Helena to become the state capital. The novel "Shootin' Iron" employs people Joscelyn remembered from his boyhood -- back when the railroad was built across the family spread in Belt. Joscelyn's unpublished memoir, "Papa was a Pioneer," digs deep into Montana's past and the family homestead. In the manuscript, he recalls the settlement of Great Falls, the copper wars, the end of the Indian wars, early cattlemen, and his father's work to homestead the ranch. "Papa found a quarter-section to his liking almost at the foot of the Highwoods, roughly 40 miles from Great Falls," the memoir reads. "It was a beautiful piece of rangeland with several fine springs of water joining to form a small stream, winding down a long coulee at the center." Alan described his grandfather's habits -- how he worked on a Sears portable typewriter and, at night, sat back in his chair, his eyes closed, running through the plotlines of a story in progress. Joscelyn typically had several stories going at once. He was fond of reading his opening paragraphs aloud as Alan sat to listen. "He always was meticulous about his opening lines," Alan said. "When you're a kid, you don't realize what's what. But there was something about his lifestyle that was pretty attractive. Grandfather always was a writer. Anything he saw he could turn into a story." Joscelyn died in Missoula at the age of 86. Shortly after, Alden gathered his father's records as well as the books he kept on his shelf. He began sifting through them, unaware how prolific his father was. Alden has since collected nearly all of Joscelyn's books, even those published several times under different titles. Stories that ran in national magazines are harder to acquire, Alden said, but he's working on tracking them down. Alden's effort to retrace his father's life was catalogued in an anthology he printed last year. Nearly 400 pages thick, the catalog represents the sum of Joscelyn's work and summarizes each piece in detail. "I decided to make a list and see what he had written and when he wrote it," Alden said. "It became a project for me that took several years. I'm still working on it." Through his research, Alden has learned a lot about his father. While Joscelyn failed to record specific dates and locations in his work, he was strong in recording "the way things were." Many of his stories captured his own father's pioneering adventures. "He tried romances, he tried mysteries, and he fooled around with other things, but Westerns are what he wrote the most," Alden said. "He never had another paying job of any kind." Alden still has his father's scrapbook -- the one filled with aging clippings from old magazines including Cosmopolitan, which published such works as the Adventures of Jay Roofus Wallingford. These, Alden said, are the stories that influenced his father as a boy. Still, reading his father's work, Alden said he doesn't see much of the man in the writing. "I look for it, but I haven't found it," Alden said. "Maybe it's there in the fact that his bad men aren't really that bad. They usually have redeeming features. His bad guys weren't evil."